Xiaomi Mi MIX 3 Night Shot Camera Sample Released - Playfuldroid! After confirming the Oct. 25 launch date for the Xiaomi Mi MIX 3, the Chinese manufacturer had released two camera samples to reveal the indoor low-light photography prowess of the smartphone. Today, the Chinese manufacturer has shared another camera sample that shows how impressive night shots it can capture. 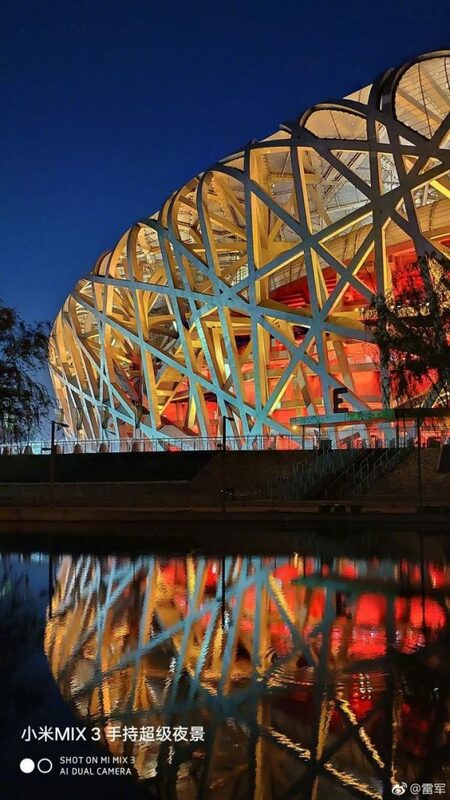 The Xiaomi Mi MIX 3 night shot camera sample reveals the rich details like clear dark blue sky in the background and the impressive color reproduction of the stylish building and water ripples. There is contradictory rumor circulating on the dual rear cameras of the Xiaomi Mi MIX 3. Some reports have claimed that it is equipped with 16-megapixel + 13-megapixel dual camera setup while another report had stated that it features 20-megapixel + 16-megapixel dual camera setup. What’s seems sure about the Mi MIX 3 is that the phone may not feature the same dual 12-megapixel rear cameras that are available on the Mi MIX 2S. The reason behind it is that since the Mi MIX 3 will carry support for 960fps slow-motion video shooting, it requires new camera sensors with onboard memory. For shooting selfies, the Mi MIX 3 will be offering its users with dual 24-megapixel cameras with LED flash. Rumors have it that the smartphone will feature 6.4-inch AMOLED display, Snapdragon 845, up to 10 GB of RAM, 3,850mAh battery and support for 5G connectivity. It is speculated that 6 GB RAM + 128 GB storage variant of the MI MIX 3 may be priced at 3,699 Yuan.